For some of the above, plastic works fine. Plastic is both soft and insulated, so there’s no problems there. However, it doesn’t have all that high of a heat tolerance, so it’ll melt if you’re not careful. Also, it’s not very strong, so it won’t do a good job scraping the bottom of a pan, nor will it hold up stirring something particularly thick. Finally, some plastics release chemicals when heated, and so if your plastic is not BPA-free, there may be some health risks from using plastic utensils in hot liquids. Metal utensils work great on the strong and heat tolerance, but not so much on the soft and insulated. Silicone is a good alternative to wood; by and large, it will handle 1-4 without a problem, if it’s a well-made utensil. Wood’s a bit harder than silicone, so you might have an easier time scraping with a wooden stirrer than a silicone one, but silicone is a whole lot easier to wash and care for, so if you’re not really used to wood, and you’re not particularly nostalgic, it’s a good alternative. I know that I’ve probably offended some people with that suggestion, but I stand by it. If you do decide on a wooden spoon, there are those who recommend a flat-edged spoon. Here’s a video from my friends Diane and Todd, the White on Rice couple, featuring Michael Ruhlman. Nice article!!! I love wooden kitchen items. We also made wooden handicrafts and furniture items from saharanpur India. Thank you. Wood is naturally antibacterial whereas plastic allows bacteria to breed (google the research by Dr Dean Cliver) The best wooden spoons are carved by hand. Machine made ones are often poorly designed and cut from too thin a piece of wood so two dimensional. 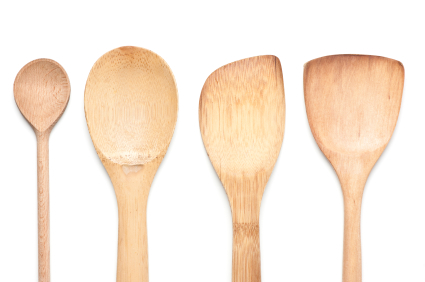 A well made wooden spoon is as beautiful an addition to the kitchen as a well made chefs knife. Nostalgia seems interesting! I am a food safety guy. Wooden utensils could usually not be well cleaned and sanitized because its porous structure may absorb oil and other cleaner detergent. Well, I like wooden spoons and chopping board. They always looks high level. One other reason (and there are probably more)-- When making meatballs , use a wooden spoon with round edges. Lot less chance of breaking them up when stirring them in the gravy. I think if my old wooden spoon broke that it would be red on the inside from all the Italian sauces I have used it on.